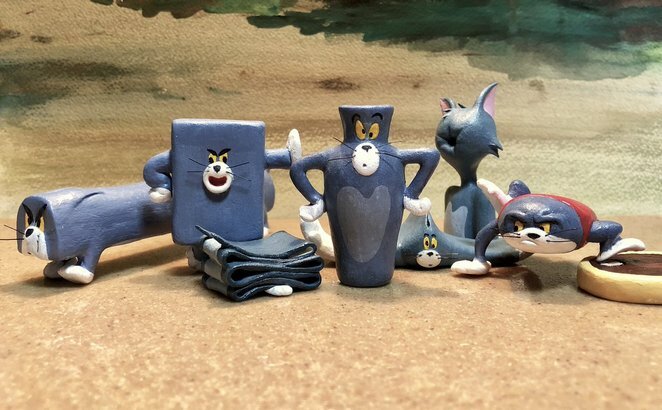 Japanese artist Taku Inoue has produced a series of lively sculptures of the beleaguered Tom Cat from the classic Tom and Jerry cartoons. Each episode included Tom chasing after Jerry in the most unique ways that would leave the unfortunate housecat feeling out of sorts. Inoue has captured how these odd chases affected Tom physically. Such examples covered the time Tom followed Jerry into the mousehole, the time Tom got stuck in a laundry roller, the time Tom got hit in the face with a billiard ball, the time a pig sat on Tom, the time Tom became a crab and the time Tom took on the shape of a vase all in his constant pursuit to catch Jerry the clever mouse.